One of the most fascinating wine regions in Germany is situated in the tri-border region between Germany, Luxembourg and France where the Saar meets the Mosel. 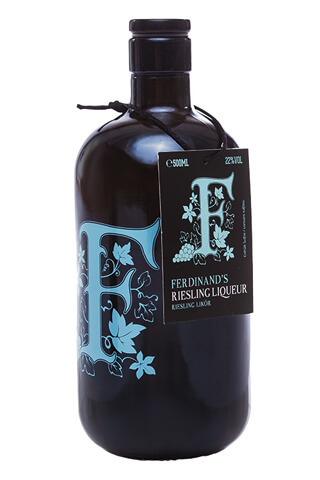 Here in the region of the Saar where the most valued Riesling-Producers of the whole country are located in between gently curved hills, the story of the Riesling-Infused Ferdinand's Saar Dry Gin begins in 2013. 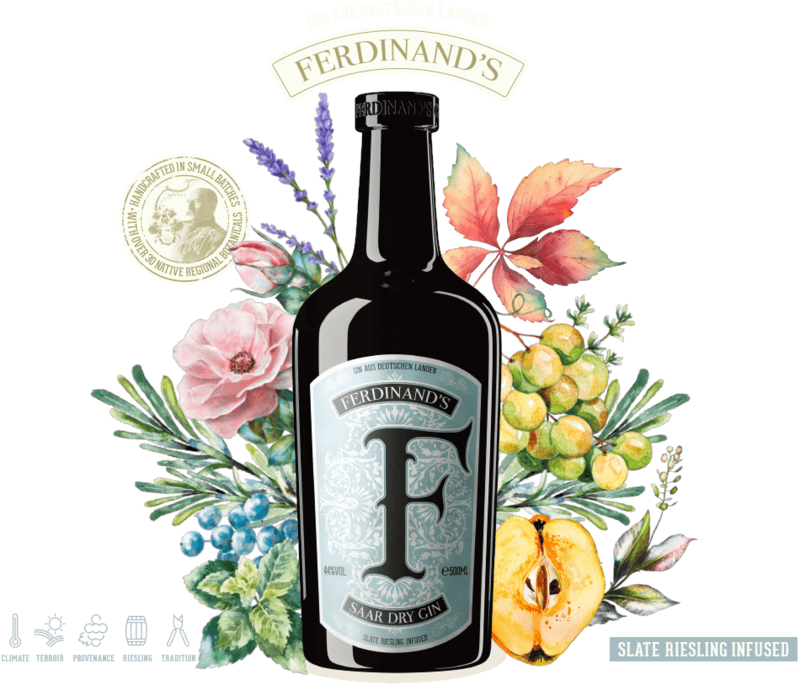 Discover our Gin, which reflects its own region in all their geographical and cultural uniqueness while seeking for an excellent qualitiy. 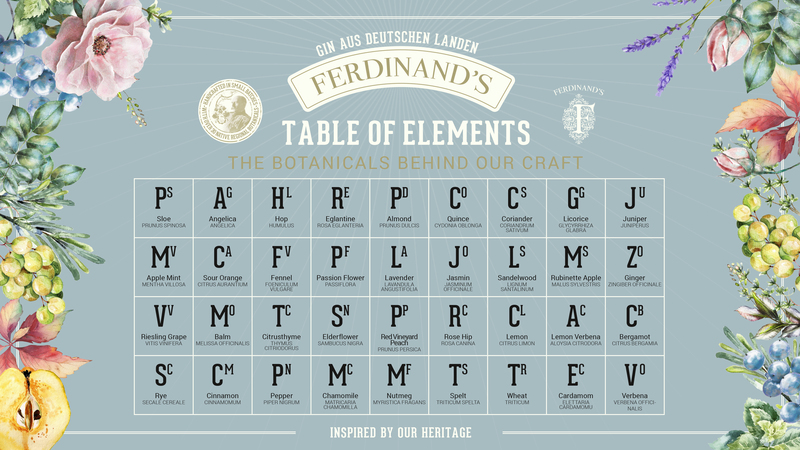 The Recipe of our Riesling-Infused Ferdinand's Saar Dry Gin is an homage to the fruitful landscape of the Saar-Region. Over 30 finely balanced botanicals mainly from our own cultivation or regional grown in combination with the finest Riesling grapes of the large Saarburger Rausch gurantee a maximum drinking pleasure. Freshly harvestet Muscat quinces, a rare Pear Quince strain, growing behind the distillery as well as an infusion of our Rausch Kabinett are the basis for our regional homage to the british Sloe Gin. Only the heart of the once-a-year distillation as well as some very special ingredients find their way into the Goldcap. This extra small batch has a remarkable character. Just the best of the vineyard is used for the infusion: Auslese Goldkapsel grapes make this distillation to a unique limited bottling. The large southern-facing slope of the Saarburger Rausch, its rough Devonian shale soil and the cool climate form the perfect basis for the first Riesling Vermouth worldwide. Ferdinand's White Vermouth is carfully aged in Mosel-Fuder casks. This kind of aging gurantees the perfect balance between the bitter-fruity Riesling and the botanicals of the vineyard. This bottling distilled in small batches gets adjusted to an alcohol content of 66,6 vol% after a four weeks storage in stoneware. This powerful Gin is perfect for Cocktails. Natural fruit juice syrup recifited of immature or green grapes of the Riesling vine from the Saar region. 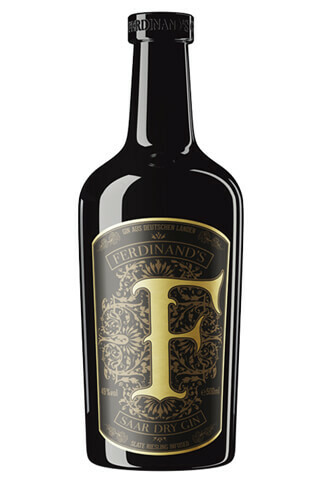 Ferdinand’s Riesling Liqueur is created on the basis of the fruity Riesling from the Saar valley. It gets refined with fruits and flowers of the Saar region and reflects the lightness and elegance of our cool developed Riesling wines. 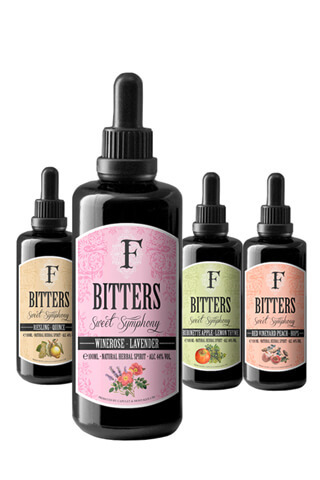 Ferdinand's Bitters Sweet Symphony are devoted to the regional principal botanicals and emphasise the exceptional taste in a highly concentrated way. They are the perfect aromatic enhancement for drinks and foods. 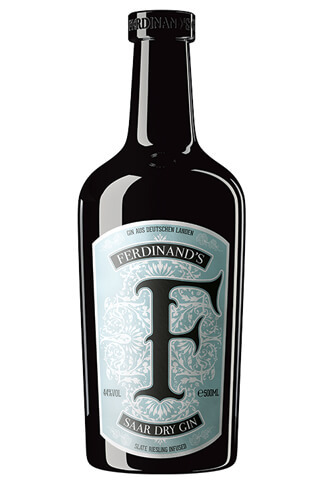 The brothers Denis Reinhardt and Erik Wimmers as well as their friends Andreas Vallendar, Master Disitiller, and Dorothee Zilliken, VDP winery Forstmeister Geltz-Zilliken, are the makers of Ferdinand's Saar Dry Gin. Sharing the passion for high-qualitiy spirits these four friends created a unique handcrafted product driven by the idea of an aromatic reproduction of their home region. Wine producer Dorothee Zilliken is running the traditional VDP vinery Forstmeister Geltz Zilliken together with her parents since 2007. 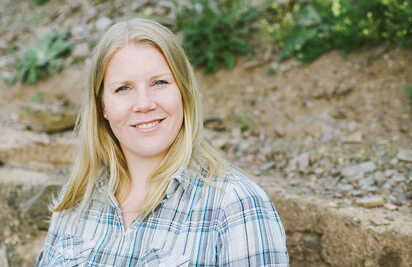 After successfully completing her studies in viniculture, viticulture and oenology in Geisenheim and a variety of practical training with well-known vintners, Dorothee dedicates herself to the vinery with great expertise, joy and commitment. Her top-quality wines are much sought after throughout the world and have secured her a place among the top international group of Riesling producers. 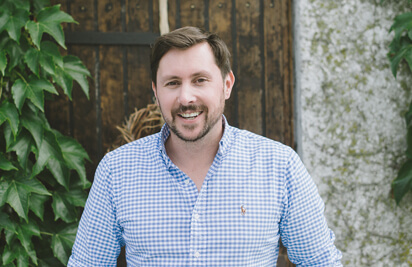 Master Distiller Andreas Vallendar has won wide recognition both nationally and internationally among connoisseurs and the trade press alike. Having finished his studies in beverage technology, the chemical laboratory technician founded the Avadis Distillery. The Vallendar family has been distilling spirits for several generations founded in 1824. 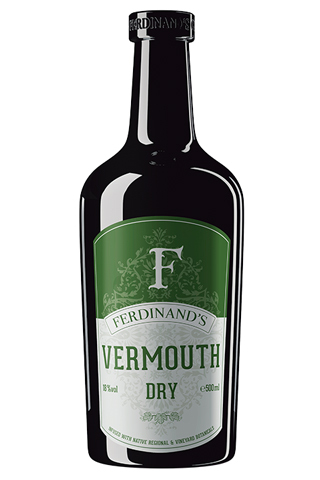 Today Andreas runs a modern bonded distillery with an awareness of tradition and innovation. 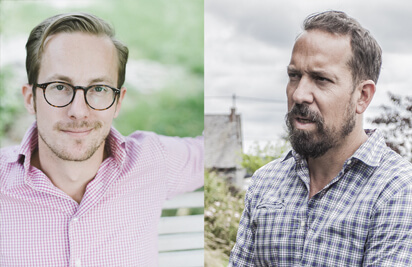 The brothers Denis Reinhardt and Erik Wimmers, managing directors of a sales agency specialized in spirits and passioned wine connoisseurs, originally had the idea to create a „Riesling inspired Gin“. By cooperating with two traditional producers whose ancenstors already characterized the style and reputation of the region their aiming for highest quality is more than fulfilled. 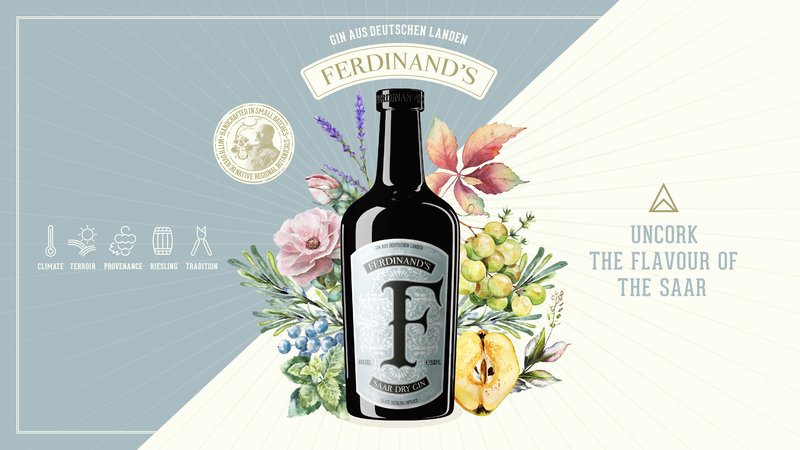 Named after the first local Royal Prussian district forester Ferdinand Geltz, Ferdinand's takes its inspiration from the bountiful Saar region and their traditions always the guiding principle „inspired by our heritage“ in mind. Nestled between steep valley sides, the Saar region enjoys a unique micro-climate. Summers end late, with long, warm days ripening the fruits, and cold nights retaining the signature acidity. The gentle breezes caress the vines and fruit trees and nature brings forth its rewards each year with a bountiful harvest. The Saar winds its way leisurely through mineral-rich shale soil, where generations old vines cling to the valley sides. The topography, geology and climatic conditions bless this ancient region with a treasure trove of flora and fauna. 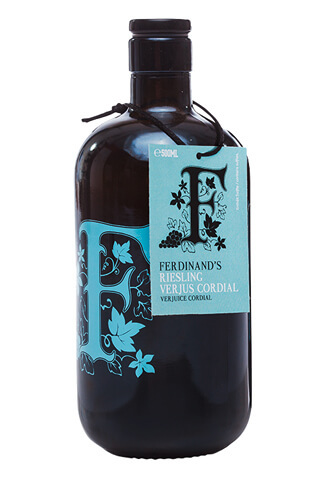 Many of these local flowers, fruits and herbs form part of the botanical cornucopia used in Ferdinand’s spirits. The Vallendar family have been distilling fine spirits for several generations in the sleepy village of Wincheringen. Here, artisanship and alchemy combine, with the results being deeply rooted in the proud traditions of the region. The true essence of the Saar – an elegant combination of old world crafts and fresh inspirations – distilled to perfection. 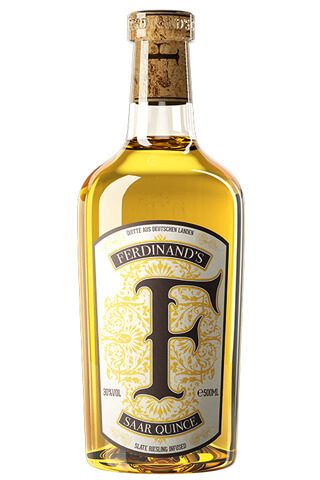 Known as the „Queen of white grapes”, the delicate, distinctive and highly aromatic Riesling wines produced over three centuries by the world-renowned Forstmeister-Geltz Zilliken VDP-Estate, are at the heart of Ferdinand’s spirits. These wines form part of the legacy of the Saar-Moselle region, historically one of the most important wine growing areas in Europe. The Saar has always been an important confluence of regional traditions and ideas. 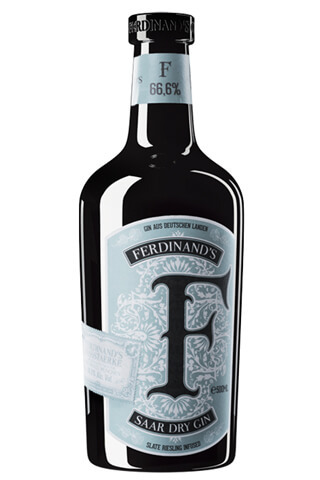 Ferdinand’s spirits – named after one of the figureheads and guardians of these local traditions; Royal Prussian Forester, Ferdinand Geltz (1851-1925) – are steeped in the character and heritage of the region, and faithfully uphold our duty to protect this unique eco-system. 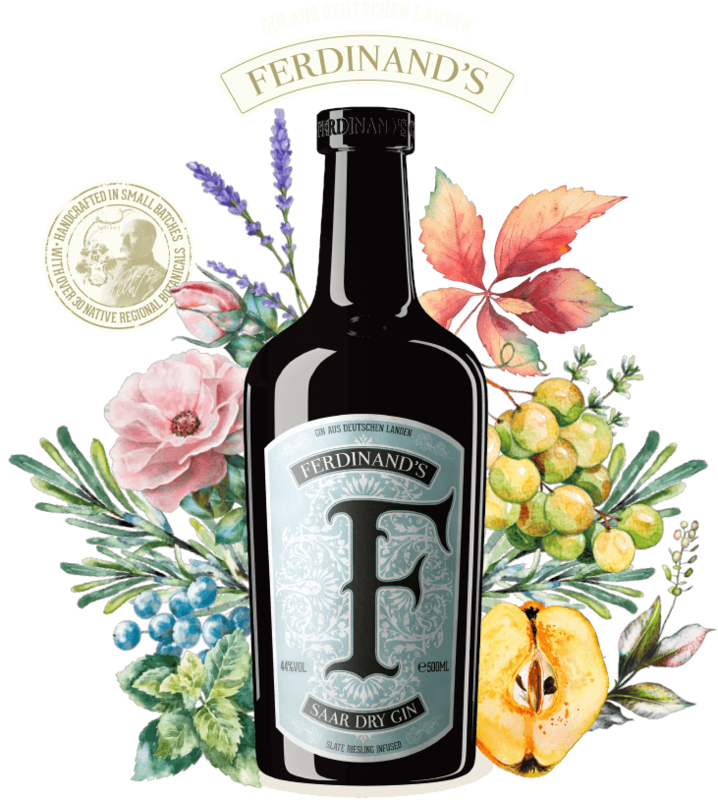 The herbs, spices and fruits used in our gin are delicately balanced and are mainly cultivated by oureselves. All our botanicals are hand-picked. Our own red vineyard peaches, quince- and rubinette apple trees are growing right behind the distillery delivering a richly flavoured fruity taste. The lavender comes from fallow vineyards in the Konzer Tälchen. 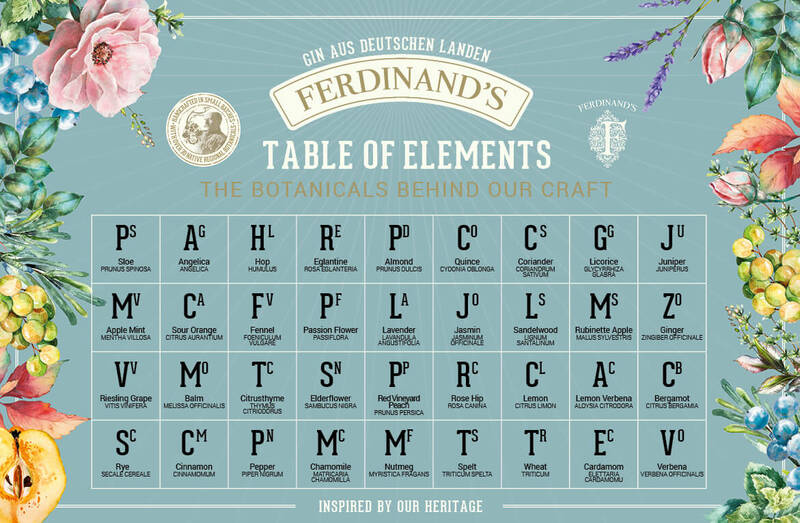 Almost all our botanicals are cultivated in the garden.